Assassin’s Creed: Liberation was released as an exclusive for the Playstation Vita back in 2012, but Ubisoft has given Liberation a fresh lease on life and released an HD remake for the PS3. I always wanted to try the game, but alas, I never owned a VITA. Now that that’s not an issue anymore, let's turn on the eagle vision and take a look at the game under a slightly different light, shall we? 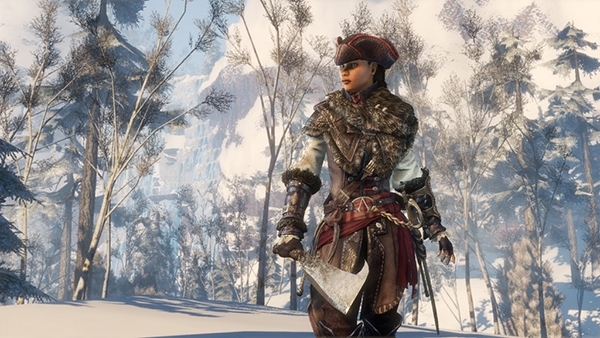 Liberation stars Aveline, a charming lady by day and a cunning assassin by night. Right off the bat, Aveline is one of the most charismatic and endearing assassins of the entire series -- right up there with Ezio in terms of personality. When she starts doubting whether her choices were right or if her sacrifices were worth it, you empathize. I loved the idea of Connor more than the actual character, and when he hit those same hurdles, I felt nowhere near the compulsion to care as I did with Aveline. Regardless of her guise, she remains compelling, so much so that even by the final twist, which I put together before it was ultimately revealed, I still wanted to see the confrontation due to how much I had invested in the character. Great protagonist: Check. Now on to New Orleans itself. In Liberation you have a two main areas, with some smaller ones thrown for good measure. The main hubs are New Orleans and the Bayou, and both are substantial in size yet aren’t so sprawling that it negatively affects the experience in any way. Assassin’s Creed 3 suffered from that immensely, as the landscape was so dense that it made traveling back and forth between them not worth it. I didn’t feel like wasting 10 minutes just getting from point A to point B. Liberation is also dense, but its more limited in scope, so while there is lots to do, you don’t have to travel so far to do so. It ultimately makes for less filler and a better experience over all. Less can be more. That segues right into my thoughts on overall playtime. A normal Assassin’s Creed game demands a great deal of time if you’re not just zipping through the main story. While this is great when talking about value for money, it doesn't necessarily make for a better gameplay experience. This was especially evident in Brotherhood and AC3, as the sheer amount of things you can do in those games was almost overwhelming, and since the spaces were so big it just led to fatigue and constant distraction. Liberation contains just the right amount of landscape, which is still filled with things to do but not so much that it keeps you from your main goal. Okay, so it's a love-fest so far, and for that I apologize. That brings us to one of my nitpicks however, which is worthwhile rewards. Full disclosure, I’m a collectible hoarder. If it's shiny and rare I want it and I want it NOW, so don’t get in my way. Liberation contains a few things of this nature, including diary pages, assassin's coins, voodoo dolls, Mayan statues, and alligator eggs. Want to know what most of those get you? Yep, that’s it. An extremely lame and slightly different hat. It would be one thing if said hat was in the shape of a Tardis or something, but that is sadly not the case. I didn’t kill all those alligators for just another grey hat. The Uplay unlockables fare much better though, as you can also get a hat there, but it's vastly different from the normal offerings. You can also unlock Connor's Tomahawk and even a redone New York sequence that lets you take control of Connor. Why you would actually do that is beyond me. Connor spends the first half of AC 3 being a whiny tool, and the second half he loses the whininess yet somehow maintains his toolish charm. The personality gap is noticeably apparent when they are together on screen. Connor is just a cardboard cutout, and a boring one at that, while Aveline shows actual emotion and chews up any scenery she’s in. A stark contrast indeed. Before I move on, let me just say that canoes are evil, and I refuse to ever ride in one again. Those things are quicker than just swimming everywhere, but are unreliable, and despite their slim profile, get stuck on everything and anything that you happen to come across. Just saying, let's agree to not do those again, cool? Alright, enough about hats and canoes. The combat receives a bit of tweaking, and I enjoyed it quite a bit. It's not completely fluid yet, but it's getting there. When it works like it's supposed to it's seamless and can produce some stunning results. The developers introduced a whip and poison darts into the mix, and the whip actually works really well in combat, though not as well when platforming. The button combination used to swing is a bit too close to your regular running and climbing configuration, so many times I would just be slightly off and miss my jump completely. Liberation also has a chain kill system, which seemed to be more work than it was worth, but once you give it a few goes it turns out to be pretty invaluable, especially in later segments when you are truly outnumbered. The combat also differs depending on which guise you are currently equipped with. You have 3 to choose from: The Lady, The Slave, and The Assassin. The Lady can't jump, but she can charm guards into escorting her through restricted areas. The slave can infiltrate areas that the other two can't, and can still fight, just not with a full arsenal of weapons and gadgets. The Assassin guise always has at least one suspicion rating, so guards are always on their guard when she is around, but she can do anything she pleases. This was a nice wrinkle, and I learned how to use this system to my advantage. Every guise also has quests and storylines that are exclusive to them, so it's best to experiment regularly to see if new quests have opened up while you're in another outfit. Outside of Assassin’s Creed II, which was my gateway drug to the series, I have to say that Liberation is my favorite of the franchise thus far. It was just the right amount of story, complexity, and world for my tastes, and starred an endearing assassin whom I hope we haven’t seen the last of (aside from the bonus missions in AC 4). This should be the template of Assassin’s Creed games going forward, where sometimes less is more. If you’ve got $20 to spare, do yourself a favor and give it try. New Orleans is calling.